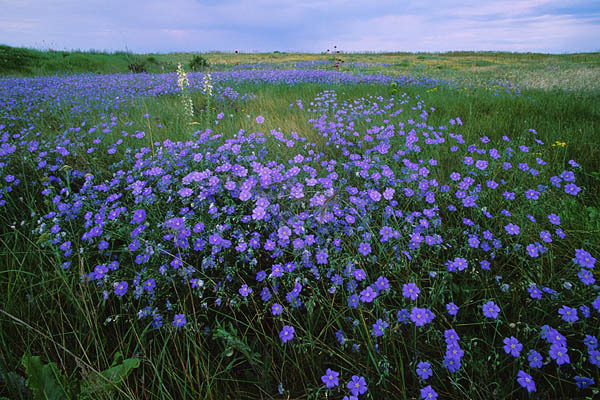 The flax plant thrives on the long days and cool nights of North Dakota and western Canada. In July, the plant blooms. 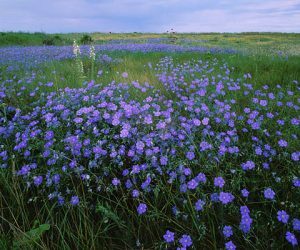 Vivid blue blossoms unfold each morning, only to drop from the plant by midday. In contrast to the beauty and elegance of the flowers, the seeds of the flax plant are tiny, brown, and plain. Without question, though, these humble seeds are the flax plant its real health treasure. Hippocrates, the Greek physician, knew it. He recommended flaxseed for the relief of abdominal pains. Charlemagne considered flax so important for the health of his subjects that he passed laws requiring its consumption. Her passion for flax eventually led her to create The Flax Cookbook, published by Marlowe & Company. Before writing the book, Magee would eat flax two, maybe three times a week—“whenever I thought of it,” she says. She had her blood-lipid levels measured right before writing the book, then committed to eating flax daily. Four months later, she had her lipids tested again. Her total cholesterol had dropped by 15 mg, and her LDLs (“bad” cholesterol) went down by 5 mg. “Eating flax is like flossing your teeth,” she says. “It’s something you can do every day that is good for you now and down the line.” Fortunately, getting your daily flax doesn’t have to be a chore; there are delicious ways to incorporate the seed into your diet. Here are the six key facts to know about flax plant. Flax boasts a hefty amount of both insoluble and soluble fiber. One tablespoon of ground flaxseed, in fact, contains roughly 2.3 grams of total fiber, more than twice the amount in oat bran. Insoluble fiber eases the digestive process and may help prevent colon cancer, while sticky soluble fiber can lower cholesterol and regulate blood sugar. With omega-3 levels higher than canola or soybean oil, flax plant is an excellent vegetable source of omega-3s, the polyunsaturated fatty acids that make fish so healthy to eat. Omega-3s have long been known to reduce the risk of stroke and heart disease. But recent research has revealed some of their subtleties, both positive and negative. It turns out that one of the reasons omega-3s are so healthy is that other foods prevalent in the American diet (processed lunch meats and snacks, for example) tend to give us an abundance of a related fatty acid, omega-6. Americans, in fact, consume about 20 times more omega-6s than omega-3s, when the ratio should be more like 4:1. Excessive amounts of omega-6s relative to omega-3s may compromise the immune system, cause blood clots, and play a role in breast-cancer formation, among other conditions. Boosting your omega-3 intake with flaxseed helps balance your ratio of omega-3s to omega-6s, checking the negative potential effects of too much omega-6. The intensive essential-fatty-acid research has raised a question, though. The specific omega-3 abundant in flaxseed is alpha-linolenic acid, or ALA, a short-chain fatty acid. Fatty fish like mackerel and tuna offer the long-chain varieties eicosapentaenoic acid (EPA) and docosahexaenoic acid (DHA). However, flax expert Diane H. Morris, Ph.D., R.D., argues that the omega-3s in fish have simply received more scientific attention than ALA. As researchers devote more time to ALA, she says, the notion of long-chain being more powerful than short-chain could change. In the meantime, Morris says that by eating flax, “you’ll see an increase in levels of ALA, EPA, and total omega-3 content in all your body’s cells.” For your overall health, boosting omega-3 intake is one of the most important things you can do, says Morris. Flaxseed is rich in lignans, which are powerful phytoestrogens (naturally occurring hormones from plants). In fact, flaxseed’s concentration of lignans is higher than that of any other food source. Besides offering a number of health benefits such as antiviral activity, lignans may protect against hormone-sensitive cancers. The anticancer effects of flaxseed are so promising, in fact, that the National Cancer Institute (NCI) recently selected it, along with five other foods, for specific research. NCI studies currently in the works include one on flaxseed’s role in slowing or preventing disease progression in men who were recently diagnosed with prostate cancer. In addition, Kailash Prasad, M.D., Ph.D., of the University of Saskatchewan, has pioneered research on the antioxidant activity of SDG, the main lignan in flax. He has found that SDG is 1.5 times more powerful than vitamin E at scavenging for free radicals. An examination of flaxseed’s role in bone metabolism and osteoporosis prevention in postmenopausal women. Research revealing that flaxseed lowers the levels of apolipoprotein B (apo B) in the bloodstream by 6–7.5 percent. This is significant because elevated levels of apo B correspond to higher levels of LDL and other particles in the blood that promote atherosclerosis, a condition in which plaque forms on artery walls. Atherosclerosis often leads to heart disease and stroke. A study currently underway, headed by osteoporosis researcher Sylvie Dodin, M.D., will evaluate the effects of flaxseed on a host of different conditions in menopausal women, such as blood-lipid levels, bone density, and cardiovascular disease. Spread out over a year, the Montreal-based study is one of the longest-term flaxseed studies to date. Seeds cost about $1 per pound out of the bulk bin at your local health-food store. Fill up a bag and toss it in your cabinet or another cool, dry place the seeds will keep, whole, for up to a year. You can eat these whole seeds, but they pass through the body undigested, offering only some fiber. To get flax’s full range of benefits, you need to break through the hard seed coat. Teeth won’t do it, but a coffee grinder works well. According to Morris, the notion that ground flaxseed quickly becomes rancid due to its high oil content is simply not true. She contends that ground flaxseed will keep at room temperature for about four months. Many people, however, store ground seeds in an airtight, opaque container in the freezer for up to 90 days. How much flaxseed do you need? Morris suggests 1–2 tablespoons daily, the low end of the average amount used in all clinical studies. Because clinical studies tend to run for a few weeks or months, the effects of long-term, larger doses are still unknown, Morris notes. Five to six tablespoons a day is considered a high intake. “We have no evidence that high doses are at all dangerous,” she says, “but you could say that we don’t have any evidence to assume they’re safe.” The only problem Morris, a nutritionist, can find with a flaxseed-heavy diet is that you’d be getting a high percentage of nutrients from just one food source. As for flaxseed oil, it’s a good source of omega-3s but contains no fiber and few if any lignans (Some manufacturers, though, add lignans back into the oil after processing). Should you go this route, don’t heat the oil—it will break down quickly. Instead, drizzle 1 teaspoon a day on salads or bread and store it in an opaque bottle in the refrigerator for up to two months. Because of flax’s lignans, err on the side of caution when it comes to consumption by children and pregnant women, Morris advises. “We have no evidence that regular consumption is either dangerous or safe for children and pregnant women,” she says, “but phytoestrogens affect hormone levels in adults.” Flaxseed oil that is not lignan-fortified is considered safe for both groups. Because no known human studies have been published on lignan-rich flaxseed’s possible interaction with birth-control pills or with the breast- cancer drug tamoxifen, leading flaxseed researcher Lilian U. Thompson, Ph.D., recommends that women taking either medication eat flaxseed with caution or avoid it altogether for now. While creating her cookbook, Magee fed all her recipes to her suspicious husband, Dennis, and two preteen daughters. She quickly learned that hiding the flax was the best route. “If you add flaxseed to fettuccine alfredo, say, people will ask, ‘What did you do to my alfredo?’” she says. Stirring it into chili, however, works perfectly. Magee mixed flax into meat, added it to the swirl of cinnamon-swirl bread, and blended it with the crunchy topping on apple crisp. She brought flax-laden sweet-and-sour meatballs to a potluck and fine-tuned all the recipes for her smoothie chapter at a poolside party. Ultimately, eating flax every day is about experimenting and being imaginative. Stir it into yogurt. Add some to your favorite pasta dish. Concoct your own flaxseed-muffin recipe. And enjoy the nutty flavor, knowing you’re making a simple change that could profoundly improve your health.